Kyle Queiro tiptoes down the sideline on an interception return. The senior safety scored a touchdown on the return to help Northwestern to a Music City Bowl victory. NASHVILLE, Tenn. — The road to victory was a rocky one, filled with twists and turns. But as the clock ran out on the 2017 season, Northwestern, once again, found a way to get it done. In a Music City Bowl marred by injury and questionable officiating decisions, the No. 21 Wildcats (10-3, 7-2 Big Ten) clung to a narrow lead for much of the game and outlasted Kentucky (7-6, 4-4 SEC) 24-23 on Friday. A serious leg injury to junior quarterback Clayton Thorson early in the game hampered NU’s offense, but a slew of timely defensive plays helped secure the Cats’ victory in spite of the adversity. The final key play came on a do-or-die 2-point conversion for Kentucky with just 37 seconds remaining. NU’s defense forced a tough throw from quarterback Stephen Johnson that hit receiver Tavin Richardson’s hands and fell incomplete, clinching a bowl victory for a program that has now seen just four in its history. Following Thorson’s second-quarter injury on a trick play, the Cats turned to Justin Jackson as they have so many times before. The senior tailback turned in a valiant effort in his final collegiate game. He plunged into the end zone on the play immediately after Thorson went down to give NU a 10-7 lead it never relinquished. In the end, Jackson toted the ball 32 times for 157 yards, while redshirt freshman running back Jeremy Larkin tacked on 112 more on just nine carries. The duo keyed an NU offense steered for much of the game by backup quarterback Matt Alviti; the senior notched just 50 yards through the air in nearly three quarters of work. Thorson’s loss also shifted new responsibility onto the Cats’ defense. The unit took some lumps, as Johnson rolled up 257 passing yards, but it bottled up a dangerous Kentucky running game after star running back Benny Snell was ejected for making contact with an official. And with limitations on the other side of the ball, NU’s defense found a way to get on the board in a pivotal moment. Senior safety Kyle Queiro undercut an out route and scored a 26-yard pick-six that gave the Cats a 24-14 lead. Still, NU needed one more defensive stand to seal the victory. “We knew even after the pick-six that it was going to come down to us, somehow, some way,” Queiro said. After a Kentucky field goal cut the advantage to 7, Cats coach Pat Fitzgerald dialed up a fourth-down sneak at his team’s 39-yard line with 2:36 to go that would have all but ended the game if successful. Instead, Alviti came up inches short, setting up a short-field drive that could have tied the game for the Wildcats from Lexington. Johnson seemed poised to do just that with a scramble into the end zone in the final minute of the game, but Kentucky coach Mark Stoops chose to go for 2 with his team trailing by a point. 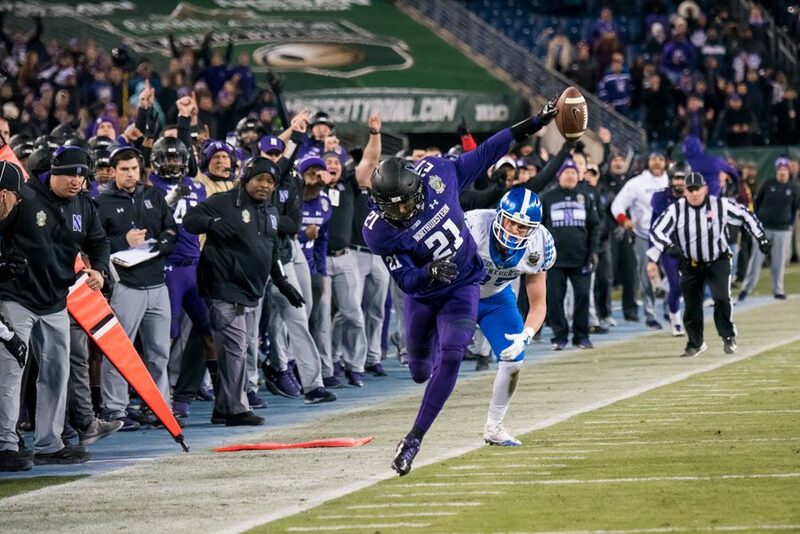 On the play —“exactly what we thought they were going to run,” Fitzgerald quipped after the game — NU’s secondary contested Richardson’s catch to get the all-important stop. Things may not have gone exactly according to plan for the Cats in Nashville, but Fitzgerald said NU’s eighth straight victory was a microcosm of the successful season.